Step 1 In a large mixing bowl, whisk together the water with the sugar and 2 teaspoons flour. Whisk in the yeast. Set aside until the yeast begins to foam or bubble, about 10 minutes. (If the yeast fails to bubble, discard the mixture and start over.) Meanwhile, whisk the salt into the remaining flour until evenly combined. Step 2 When the yeast is bubbly, stir in the oil using a fork. Begin adding the flour mixture, a cup at a time, stirring until combined. As more flour is added, it may become tough to stir the dough with the fork. Continue incorporating the flour with your hands, gently kneading it into the dough while still in the bowl. 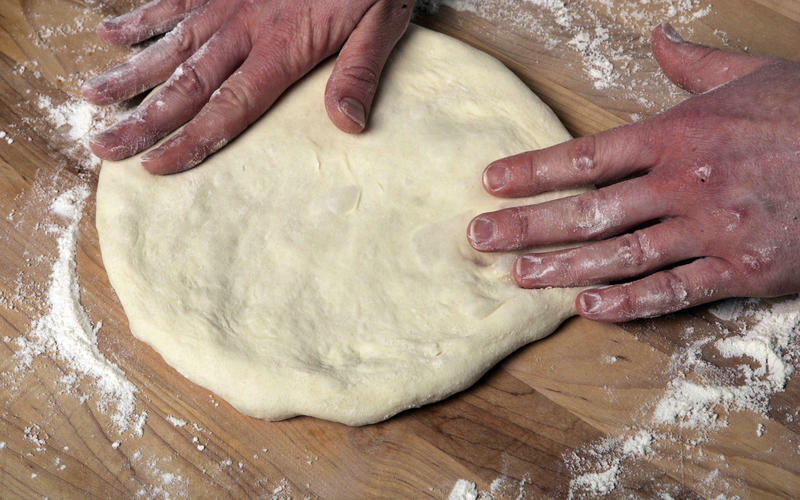 When all the flour is added, turn the dough out onto a well-floured board. Step 3Knead the dough just until it comes together in a smooth, supple mass, 7 to 10 minutes. Flour the dough and board as needed to enable kneading, but do not over-flour the dough or it will be tough; the dough should be very moist and somewhat sticky throughout (the high moisture content will keep the crust from drying out when baked). Step 4Clean and lightly oil the mixing bowl. Place the dough back in the bowl, lightly oil the top of the dough, then cover the bowl with plastic wrap and refrigerate overnight (this slows the proofing process to allow the flavors to develop). Step 5About 2 hours before baking, remove the dough from the refrigerator, punch it down and divide it into 4 equal pieces. Roll each piece into a ball and place them on a greased baking sheet. Lightly oil the top of each ball and loosely cover with plastic wrap. Set aside until almost doubled in size, 1 to 2 hours. Step 6Lightly flour each ball of dough to keep it from sticking. Gently stretch each ball into a flat disk, working from the center of the dough outward, then stretching the outer crust to widen the disk. If the dough springs back, set it aside to rest on a floured surface and move to the next ball. Continue to stretch until each disk is 10 to 12 inches in diameter. Step 7Place each disk on a well-floured pizza peel or flat baking sheet before assembling to prevent the pizza from sticking before it is moved to the oven. Assemble the pizzas and bake. In Recipes-list.com we have selected the most viewed recipes from category - Best recipes Breads . Enjoy the best recipes specially selected for you! Basic pizza dough is the right choice that will satisfy all your claims.